In the communities where PEAS works, PEAS students are likely to be the first in their families to access secondary school. Secondary school graduates (including PEAS graduates) will often be seen as role models in their communities. As such, they are well-equipped to drive positive change and act as role models to their fellow students. A PEAS education will instil a desire in students to improve the world around them for the collective benefit of their communities. They will have the confidence, ambition and self-belief to try to improve and challenge the status quo. Student leadership opportunities including Prefectorial structures and the Student Council is one way that PEAS is ensuring that students leave school with the skills and mind-sets necessary to be a force for change within their communities after they leave school. Below is an example of the Student Prefectorial structure at PEAS Kityerera High School in Uganda and the Student Council structure at PEAS Kawama Secondary School in Zambia. In PEAS schools, Student Prefects are nominated to support the school leadership team and administration in helping ensure that the school runs smoothly. The Student Prefects meet as a group every two weeks, and meet the school leadership team once a month to share successes, challenges and areas where they need additional support. The process begins with an advert announcing each Student Prefect role and calling for applications. Once applications close, a selection committee shortlists 2-3 candidates per role. Shortlisted candidates then begin their campaigns by sharing their aspirations and vision for the role with their classmates, culminating in a rally where each candidate presents to the student body. The elections follow. To ensure that elections provide each candidate equal opportunity, an agent witnesses the counting of the vote. Successful candidates are sworn in at a small celebration where they sign off on the duties and responsibilities for their respective role. Upon being sworn in they receive a special dress code and undergo a one-week induction, led by the outgoing Prefect for their respective role. The structure of the Student Prefectorial at PEAS Kawama is quite different from the PEAS Kityerera model. The school leadership in Zambia consists of a Head Boy and a Head Girl, supported by a Deputy Head Boy and a Deputy Head Girl, 2-4 Senior Prefects and other Prefects. The Head Boy and Girl act as the bridge between the Matron and Patron and the student body. All other Prefects are assigned classes to monitor and maintain, and are in charge of ensuring that the rules are respected in the absence of a teacher. In addition to Prefects, PEAS Kawama Secondary School also has a Student Council, which provides a platform for communication between students and teachers and allows students to voice their concerns in a participatory and democratic way. The Student Council serves as a more interactive way to problem solve around issues that student body raises. In contrast, Student Prefects are tasked with ensuring that school rules are respected. Each class selects two pupils, one male and one female, to represent the whole class and the executives are then elected once a year by previous Student Council members. One male teacher (Patron) and one female teacher (Matron) listen to the concerns of the students and represent the school staff. Student Councils meet on a weekly basis to discuss student welfare and address any concerns. 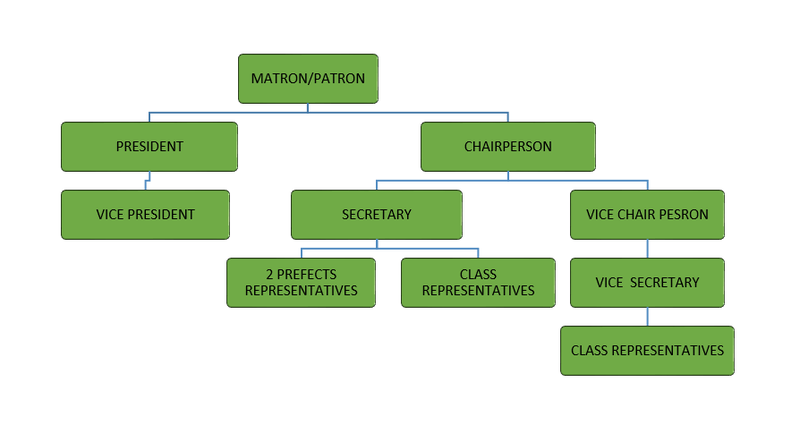 Below is a diagram that shows the structure of the Student Council at PEAS Kawama. PEAS believes that education should enable students to make lasting improvements to their worlds. Every PEAS school reflects the supporting community, and will offer different opportunities for each student to grow. Student leadership positions is one way that a PEAS student can develop the skills and mind-sets necessary to drive positive change within their communities.